Beware, Yale is full of social justice warriors. 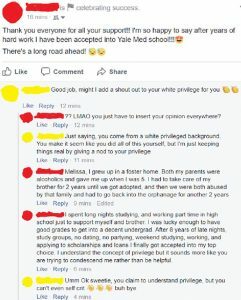 “Good job, might I add a shout out to your white privilege for you,” Melissa wrote. “I spent long nights studying, and working part time in high school just to support myself and brother. I was lucky enough to have good grades to get into a decent undergrad,” the student wrote, according to the Daily Mail. She detailed the “8 years” she spent working hard to get accepted into college.